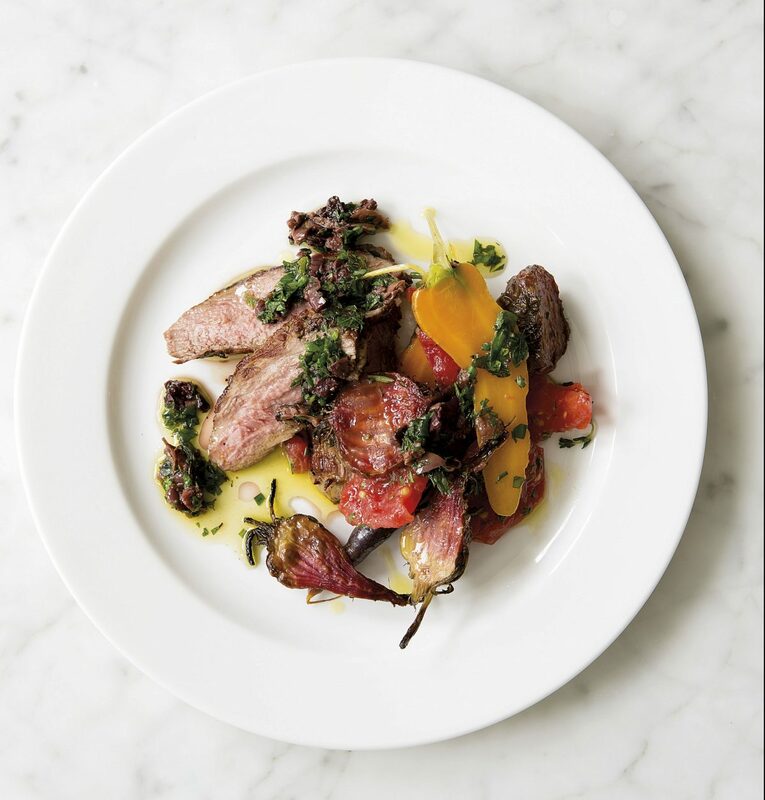 We often have grilled lamb on the menu at Spring – in one guise or another. Sometimes we rub the surface with spices to give it a lovely Middle Eastern feel, which works so well with the flavour created from the flames on the grill. Here the lamb is just really well seasoned on the outside, allowing the sweet, earthy flavours of young carrots and beetroot to shine through. Cut the lamb into 6 portions. Mix the garlic, thyme, 4 tbsp olive oil and the lemon juice together in a bowl large enough to hold the lamb. Add the lamb and turn to coat well. Cover and leave to marinate for at least 2 hours, turning occasionally. Meanwhile, prepare the vegetables and sauce. Preheat the oven to 200°C/Gas 6. For the sauce, roughly chop the olives and mint, combine in a bowl and add the olive oil, wine vinegar and a good pinch of salt. Stir well and set aside. Place the beetroot in a roasting tray, drizzle with 2 tbsp olive oil and season with salt and pepper. Cover the tray tightly with foil and cook on the middle shelf of the oven for 30 minutes. Add the carrots to the tray, toss with the beetroot and roast, uncovered, for 35 minutes or until both carrots and beetroot are tender when pierced with a sharp knife. In the meantime, tear the tomatoes in half with your hands and place them in a bowl. Add the chopped rosemary and 1 tbsp olive oil, season with salt and pepper and toss to mix. Once the roasted vegetables are cooked, remove from the oven and add the tomatoes. Toss to combine; keep warm. To cook the lamb, turn the grill to high. Remove the meat from the marinade, pat dry and season well. Grill for a few minutes, turning as necessary to brown well all over, then turn the heat to low and cook for 6 minutes on each side. Remove and set aside in a warm place to rest for 10 minutes. Slice the lamb and arrange on warm plates with the roasted vegetables. Spoon over some olive and mint sauce to serve.